For $60!! Yes, please! I also picked up a great console table for $10 at the same sale. I quickly paid the gal and promised to return at the end of the day to pick up my bargains, so I could get back to my own sale. Ready to see what she looks like now?? Paint is magical, isn’t it? 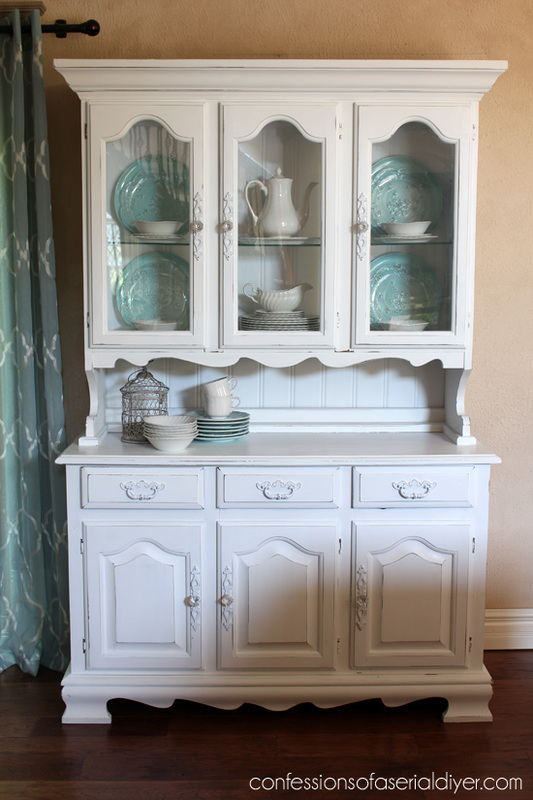 To me a simple white just looks so fresh and clean, and I really think a simple white makeover is just what this hutch needed. 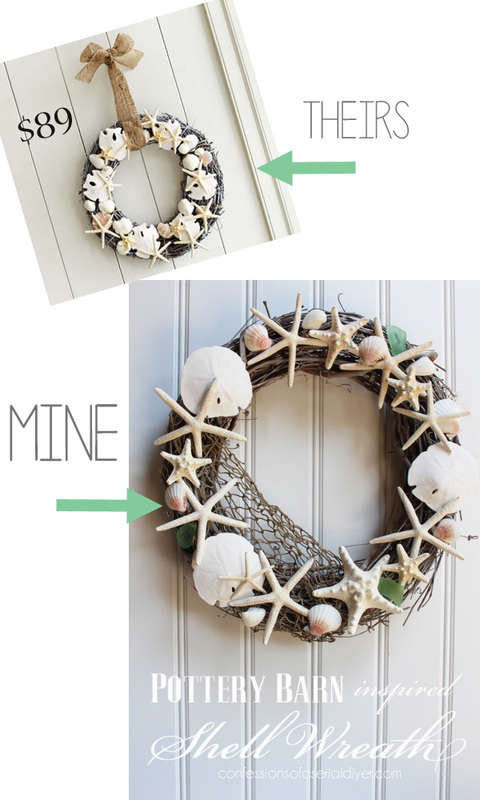 You might recognize that bead board from my PB inspired shell wreath I shared recently! 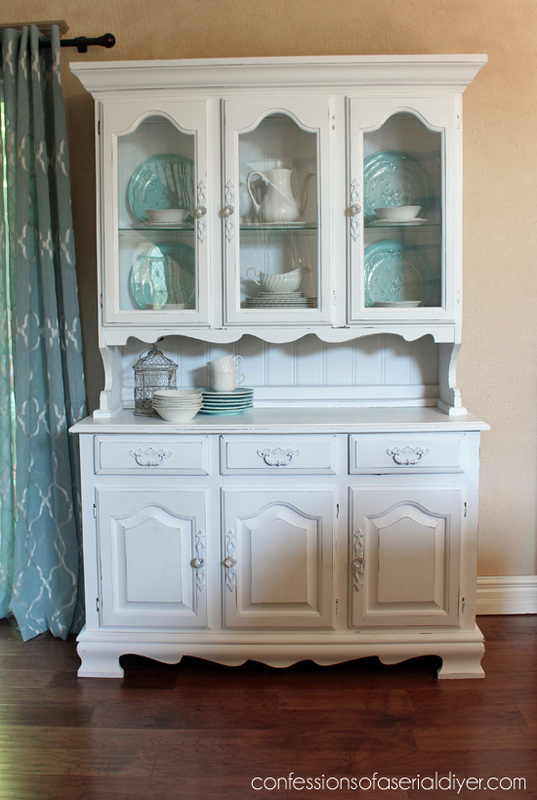 To paint this piece I used Annie Sloan’s Pure White (found 3/4 full at a yard sale for $4!) until it ran out. Then I used my DIY chalk paint to finish it off. 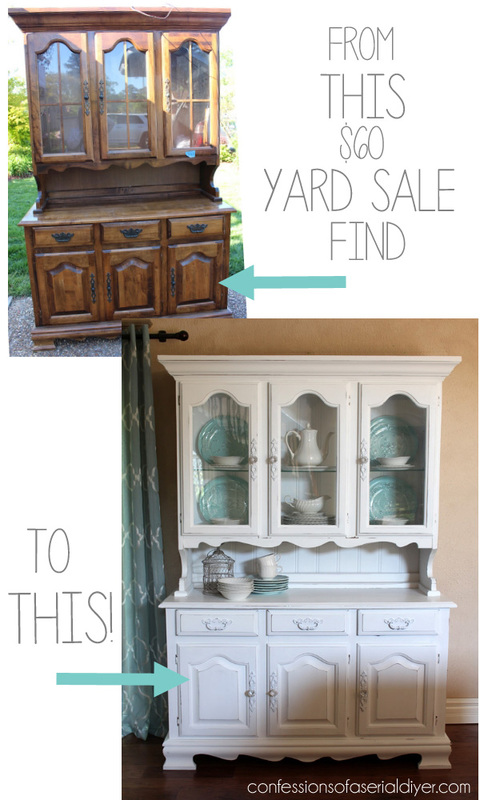 (No priming needed for chalk paint.) Then I gave it a good sanding and a coat of Annie Sloan’s clear soft wax to seal (two coats on the top). Although this was in perfect condition, the inside of the bottom smelled a bit musty. I sprayed it with two coats of Zinsser shellac in the yellow can and left the doors open for a few days. That did the trick. 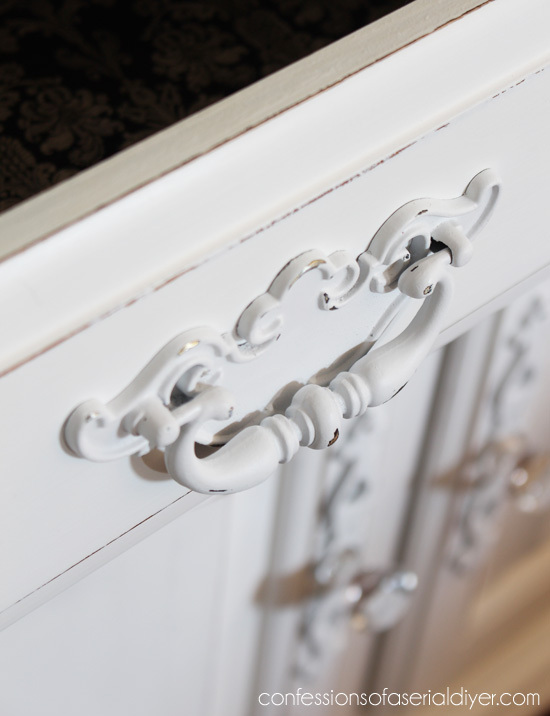 Hardware is easy to update with a couple of coats of spray paint. I used Rustoleum’s satin white for these. Then I took the sand paper lightly to the edges. I used to have white berber carpet here. I’m pretty sure it would not have looked as pretty! I chose not to add the fret work back to the windows. It seemed a little busy to me with the curve of the windows. My parents came over and sat with my youngest since he was sick so my hubby and I could take this to my shop. It’s such a relief to get pieces like this delivered safely! Hopefully it will find a loving new home very soon. The girls that sold this to me were so excited to be getting rid of it that they were almost giddy. If they only knew what it could have been! What a steal and such a beautiful, ( lighted ? ) hutch. Such a wonderful make-over. That won’t last long in your shop. 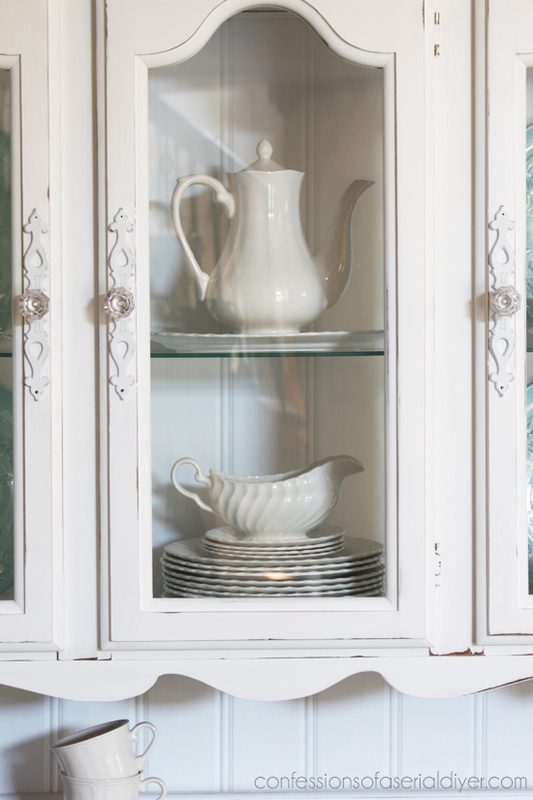 Only wish I lived closer as my Tiara dinnerware would look awesome in that but only one drawback with the hutch. It has glass shelves and me and glass shelving just don’t go well together. Looks great Christy!! Do you brush the whole piece? I am thinking about painting our bedroom furniture and not sure how to do it. We just painted our bedroom and am ready to tackle the furniture. How is your little one? Hope he is feeling better. Hi Christy, it IS amazing what paint can do, and of course a good eye and skill! Beautifully done. I barbeque’d this weekend at a friends in VA beach, thought of you. Glad you enjoyed your weekend. Lovely!!!! You do such a great job rescuing pieces of furniture! I recently purchased a sweet little waterfall dresser that I have taken apart to make two night stands. 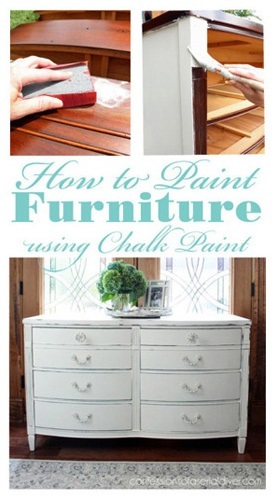 I make my own chalk paint too! I store it in glass mason jars so I can “see” what color it is. It looks so pretty sitting on the shelf. I am a teacher and today is my second day of summer vacation. Yesterday I spray painted a Costco cart turquoise for a friend. We have a booth at the best antique store in Chattanooga, the Knitting Mill. If you are ever in this area, take a look! This looks great!! What a fun makeover. 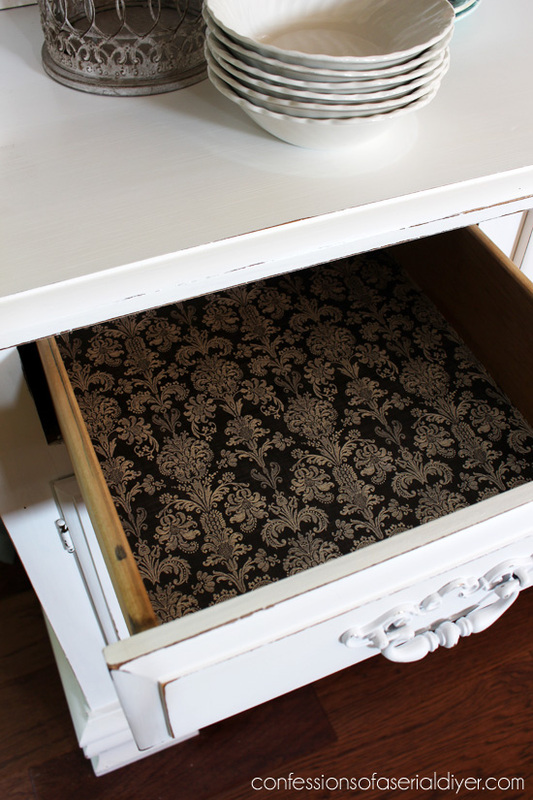 Love the paper inside the drawers, too! 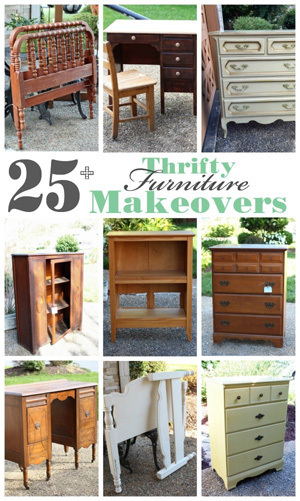 What a gorgeous makeover! It turned out beautifully and I love the beadboard! 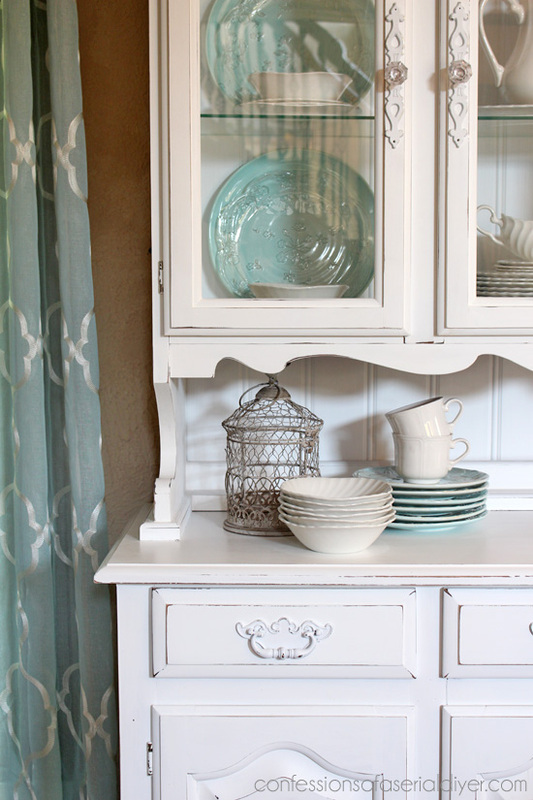 Love it in a pure simple white – so pretty with those aqua dishes. 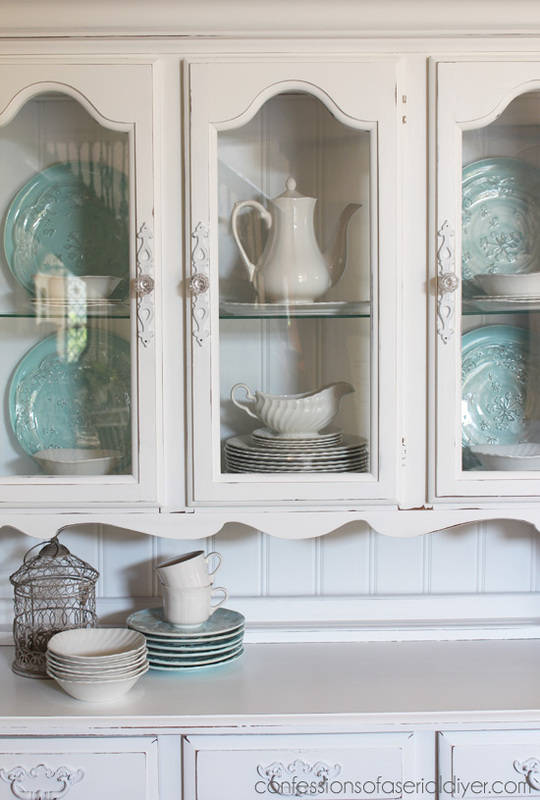 The beadboard back is perfect along with those glass knobs. I’m sure it’ll sell quickly if it hasn’t already Christy! Beautiful! Was adding the bead board difficult? Love it, love it, love it! And I collect those same Johnson Bros. Snow White dishes too! Absolutely stunning job Christy! 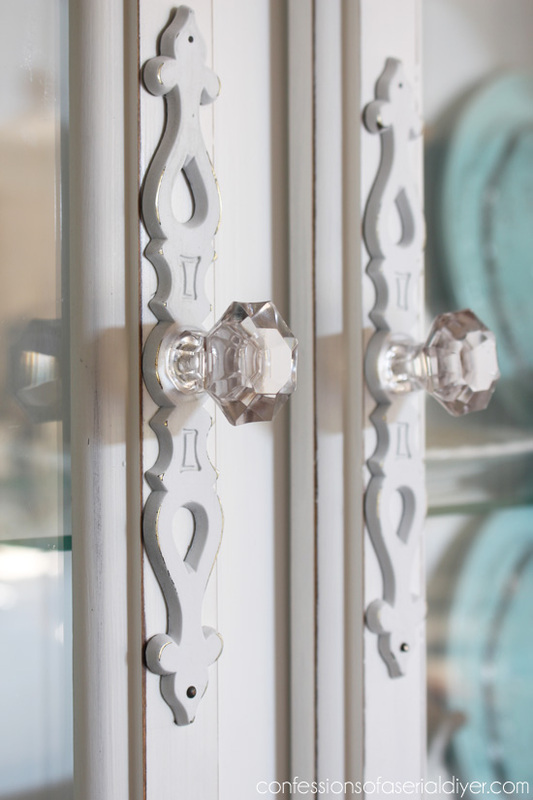 How did you paint around the curved glass on top of doors? Taped around the curves (so hard to do!) And remove the cross bars (for lack of a better description!) on the glass door panels?? Thanks so much! Thanks so much, Nanette! Luckily I was able to remove the glass panels, which made it so much easier! I LOVE how it looks now! And the bead board idea is so great. I am going to use that idea! Thanks, Rose! 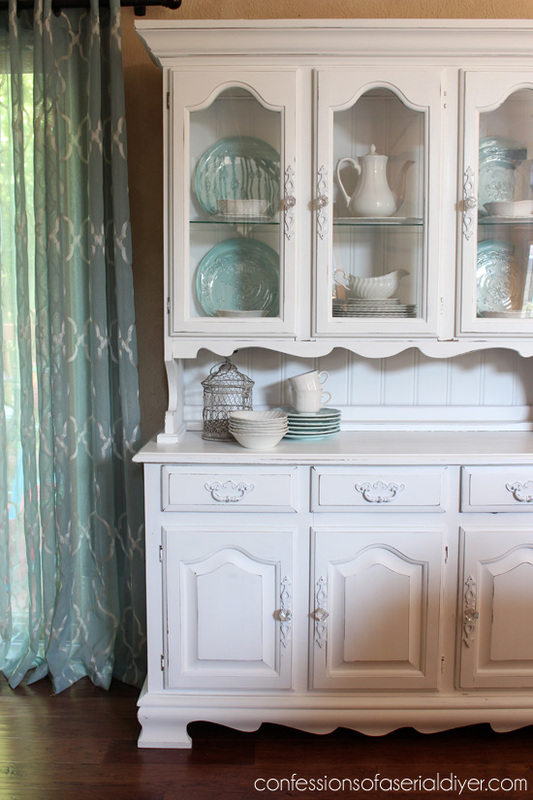 I love the instant charm that bead board adds! Looks fantastic!! If only people would see past what things are and see what they “could be”! (But then again, if everyone did that…we wouldn’t find such great bargains, either!) 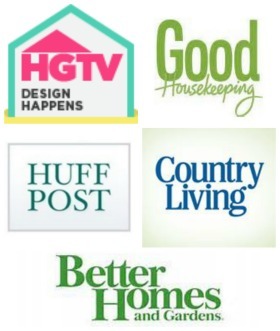 You do a great job, and I really enjoy your blog! Stunning! I am so glad you don’t have that white Berber carpeting anymore! 😉 Looks so pretty against the wood. And yes, good choice on the windows! So much better without! Christy, I love EVERYTHING you do. 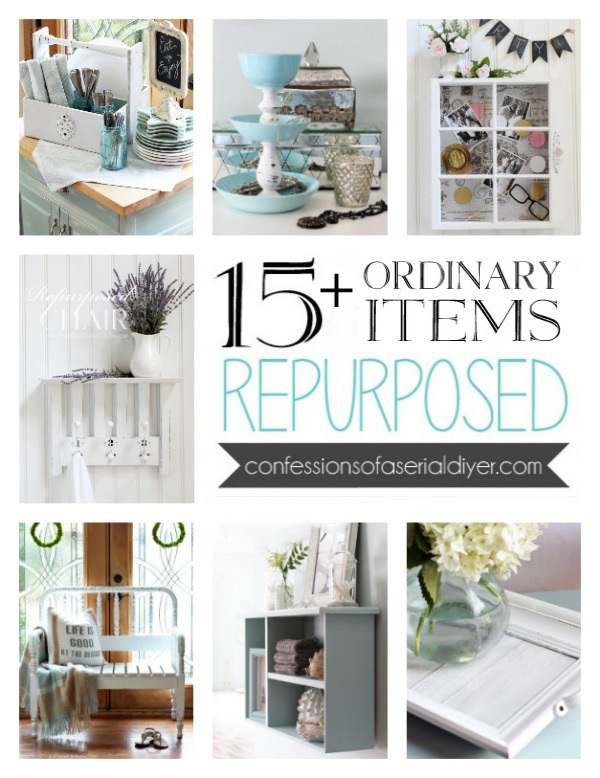 While I don’t have a blog, I am an aspiring furniture re-doer! You’re my inspiration!! 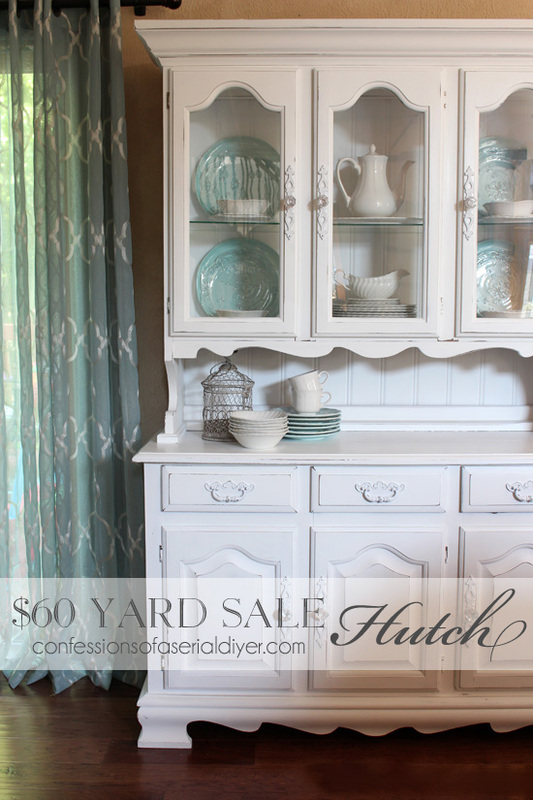 Hi Christy, I have a Hutch almost Identical to yours. 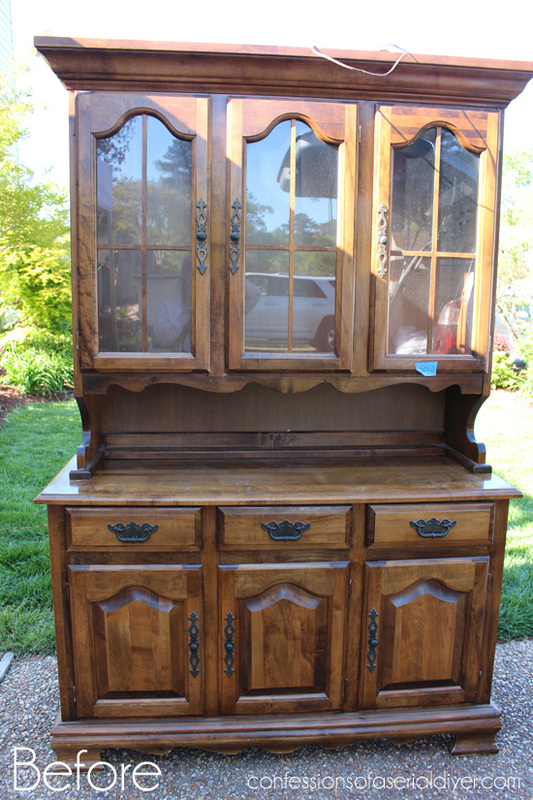 I bought a new (used) Hutch that is bigger that the one I have like yours and was going to post it For Sale on Craigslist. I paid $300.00 for it about 18 years ago and I saw a few similar on Craigslist selling for about $60.00 also. I am thinking of painting it also and hoping I might get more. My only problem is that I have not repainted anything ever but I really want to learn. When I saw yours I know that is what I really want to do. 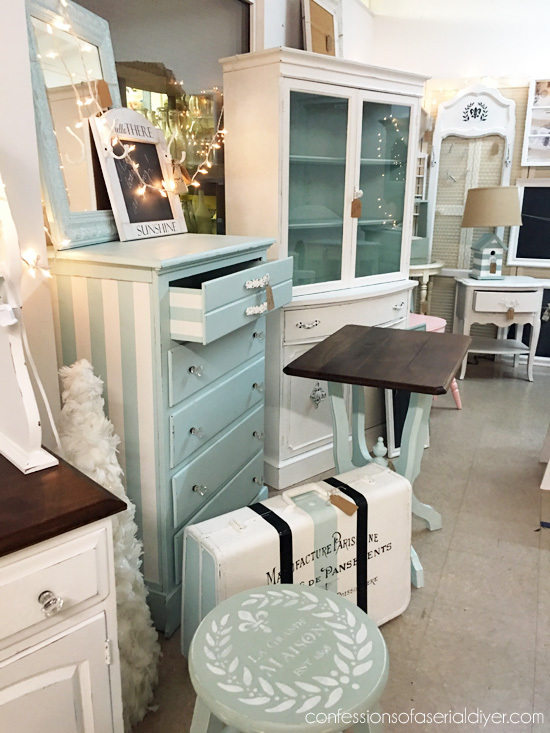 I am not ready to learn how to chalk paint but would like to know if you could recommend a paint brand and color and what type of finish (flat, satin or gloss) I should use. Any help you could provide would be so much appreciated. Did you sell the Hutch yet ??? Thanks again. Wow lucky that you get to have your grandmother’s pieces! 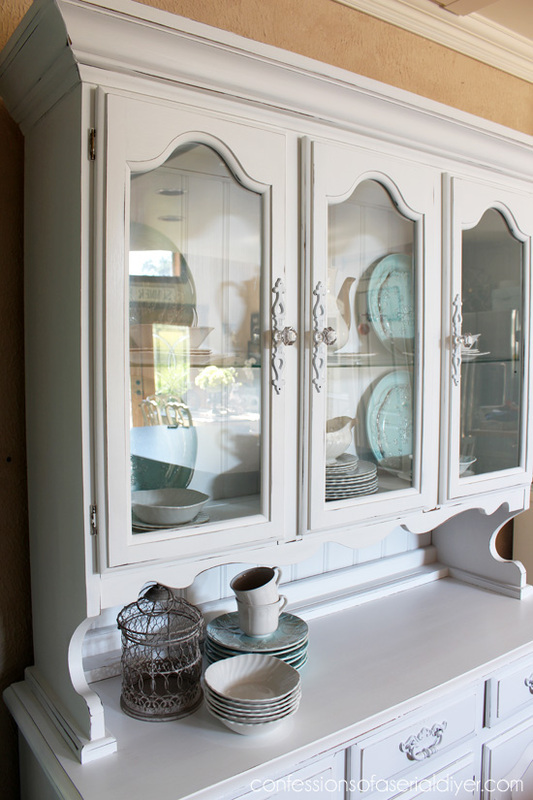 You would not normally need to sand first with chalk paint, and on the hutch, I would say go for it. Because the table is a higher traffic piece, I would at least lightly sand the table top first. Good luck!